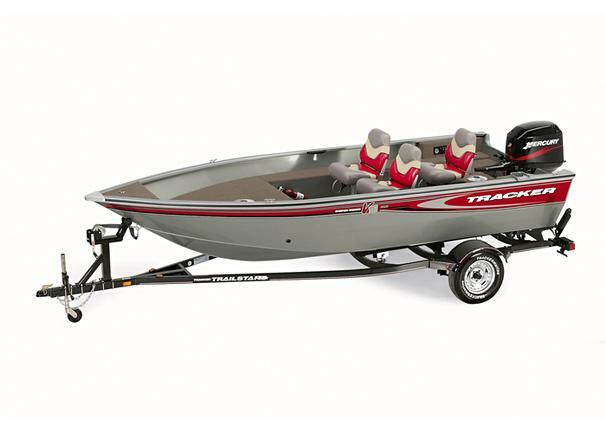 Boat Description Our 16-foot tiller-controlled Super Guide V-16 T DLX offers a highly flexible fishing layout, standard seating for three and a large divided livewell with baitwell insert. It features elevated fishing decks (with seat bases) both fore and aft, plus lots of storage in the bow and along the sides. Its rugged all-welded construction holds a lot of value for first-time boaters and for those who simply want a compact, very maneuverable Deep V fishing boat. Package includes Mercury Pro Series outboard, pre-wiring for a trolling motor, 23-gallon divided aerated livewell with timer and baitwell insert plus custom trailer with EZ lube hubs and GalvaShield protection. Dry Weight 790 lb approx. Engine Notes Additional Mercury engine options available. Four-stroke engines also available.